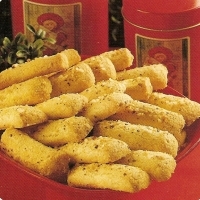 These cookies are a great christmas or holiday treat, also a good accompaniment for ice cream or fruit desserts. Beat in egg yolks and almond extract. Add salt. Sift the flour and mix well. Add enough of the flour to make it a pliable dough and chill for 30 minutes. To shape, divide dough into 6 equal portions. Roll out each portion to make a rope, abut 24 inches long. Divide each into 2-inch stips. Place on cookie sheets. Brush with egg white and sprinkle wih sugar and almonds. Bake at 375.F for about 10 minues or until cookies feel firm and are lightly browned around edges. Let cool on cookie sheets fr a few minutes, then remove onto wire rack to cool completely. This recipe is wonderful! I did change it a bit, as I can never ever follow a recipe to the T, but I like my changes. :-) I made the cookies smaller, not 2 inches long. Or should I say, my husband made them smaller. :-) He's Austrian, and Austrian cookies are minute. To me, an American, cookies should last a few bites. However, back to the recipe review - we rolled the egg-basted cookies in slivered almonds instead of sprinkling them over to make sure they stuck, and I used slivered instead of chopped to get a more delicate flavor. Lastly, I didn't sprinkle the extra sugar over. I like things less sweet. My maternal Great Grandparents came from Sweden but none of the recipes have ever been passed down. I'll be making these at Christmas for sure. Thanks for the great post and for giving back a piece of my heritage.